Microgaming have quite possibly developed more classic 3 reels lots than any other online casino and software developer, and Goblins Gold is another one of those titles in that genre. Focusing on the wealth of a green goblin as its theme, this title offers more than just the basic single payline gameplay and has a number of features that would give it an advantage over other more basic classic slots currently on the market. 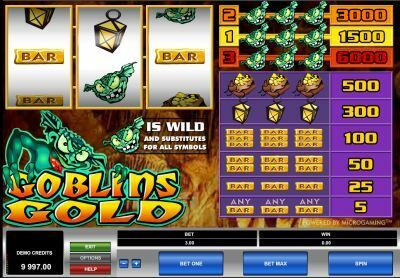 Goblins Gold is different from other classic slots because it not only has a special icon, but it also contains 3 paylines on its 3 reels, making the slot easier for players to win. Wagers can be staked from as little as $0.25 a line, up to $15 for all lines and the maximum wager. Only one coin per line can be wagered, and coin denominations vary from $0.25 up to $5. A few classic slot icons make their appearance in this title, with single bars, double bars and triple bars being those symbols. Other symbols used in the slot are designed to fit in with the theme of the game, and these include a lantern, a satchel of gold and of course, the nasty looking goblin itself, which is without a shadow of a doubt, the most important icon in the slot. As mentioned there is one special feature in this slot, and that is thanks to the single most important icon, the goblin symbol. This symbol, as well being responsible for the biggest payouts, is also a wild icon. When found on a payline, it will act as a replacement symbol, to help players complete a winning combination on a payline. The lowest paying combination in this classic slot is for any 3 bar icons on a payline, which will reward the player with 5 coins. A total of 25 coins is made possible for 3 single bars, whilst 3 double bars are worth 50 coins. 3 triple bars will pay up 100 coins to the player, and 3 lanterns will see the player win 300 coins. A top standard payout of 500 coins can be yours for lining up 3 satchels of gold on a payline. All in all, the payouts in this slot are far more generous and wealthy than in virtually any other Microgaming classic slot machine title. The goblin icon is at it again, making its importance known. If a player wishes to win the top jackpot, they will need to line three of these up on a payline. Just which payline they land the three symbols on, will determine how much of a jackpot they win. Three goblins on the first payline, in the centre of the reels, will award a jackpot payout of 1,500 coins. Players can double that to 3,000 coins if they land the same symbols on the second payline, and then double that again for 6,000 coins if they get all 3 goblins on the third payline, which happens to be the top jackpot in the slot.